It&apos;s American Craft Beer Week and in celebration, I decided to stop into a few of the local breweries here in Northwest Indiana to get a taste of the flavor that&apos;s sweeping the nation. It just so happened that my girlfriend&apos;s sister was in town for part of this week and she&apos;s an avid craft beer fan, so it was a perfect way to introduce her to some new sights around town while visiting some of my own personal favorite places to enjoy a good beer. She lives in Austin, Texas, one of the more famous craft beer towns in the country, so I was very curious how she thought our local breweries here would stack up. Our first stop was one of the newer breweries in the region, Wildrose Brewing. Located in Griffith, Wildrose Brewing just opened back in March, but they have already emerged as one of the hottest spots in the region to visit for great craft beer. Both my girlfriend and her sister were impressed with the fantastic design of the building and the vast selection of beers on tap. You can just tell from the moment you walk into Wildrose that this place is happening. While I do enjoy a good craft beer from time to time, I&apos;m hardly an expert. The folks at Wildrose Brewing are eager to educate you and try to help you find something that is perfect for your taste palate. I decided to go for the Mornin&apos; James coffee-based beer. This was a real treat, as often the darker brews are bitter or have an aftertaste that takes some getting used to, but Mornin&apos; James is smooth and velvety to the taste buds. All three of us quite enjoyed the flavor of Mornin&apos; James. My girlfriend&apos;s favorite beer was the Red Rye&apos;der, which is a nod to a certain Christmas classic we love around these parts. It&apos;s a full-bodied beer, with a nice aroma and great rye taste. She really loved it and her sister did too, but I definitely preferred the Mornin&apos; James. The great part about craft beer is finding those different flavors that suit your taste buds. It&apos;s rare for me to find a dark beer that I enjoy so much. Perhaps the most surprising beer on tap at Wildrose was Yoga Pants, which is actually a brew from The Devil&apos;s Trumpet in Merrillville. It had a nice, light IPA style to it, and it was great to see the local breweries supporting each other and having different beers other than their own available. My girlfriend&apos;s sister really enjoyed this beer and was blown away by all the choices offered at Wildrose Brewing. Our next stop was Hunter&apos;s Brewing, which has been around in the area for quite some time and is still one of the top destinations for those who love craft beer. 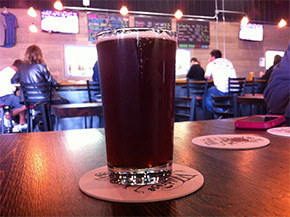 Located in Chesterton, Hunter&apos;s Brewing offers a bit of a different atmosphere than Wildrose. Because the brewery is smaller, you&apos;re able to get a quieter and more relaxed feel. This is definitely not the "party bar," but rather a place to gather together with friends and enjoy the great taste of craft beer. I dig these more intimate spots, and Hunter&apos;s Brewing is one place that you can easily lose track of time in because you&apos;re just enjoying the ambiance. All three of us ended up with the Steel Town Girl saison beer, which hasn&apos;t been available at Hunter&apos;s Brewing for quite some time. This is a great farmhouse ale that&apos;s good for beginners to the craft beer scene as well as veterans who love the taste. One of the things I love about Hunter&apos;s Brewing is that they brew up smaller batches, which means there&apos;s always something new on tap! 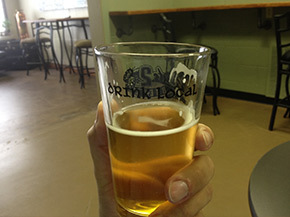 Last but certainly not least is another new brewery on the block - Route 2 Brews in Lowell. They opened up this past November, and they&apos;re already the talk of the town in Lowell. I can say that with some conviction because I saw two different people come into the brewery while I was there, mentioning that they&apos;d never been there before but that, it had been recommended by a friend. Word of mouth is very strong for this place and for good reason. One of the really cool elements of Route 2 Brews is that they have a window that allows you to see back into the brewery area where they&apos;re brewing the beer. When I was there, I was able to watch them whip up a batch of their latest concoction. While a lot of breweries have their brewing areas available to see, Route 2 really made it feel like I was right there in the thick of it as I enjoyed my beer. Speaking of beer, while Route 2 may have some wild names, their beer is some of the best I&apos;ve tasted. You have to try the Psychotic Blonde! It&apos;s a light farmhouse blonde ale that is smooth to drink and doesn&apos;t have any bitter notes or aftertaste. If you&apos;ve never tried craft beer before, this is the perfect beer to get your feet wet. And I have to mention that Route 2 is a very quaint place, with no loud, booming music or blaring TVs. It&apos;s exactly the kind of place that could be the neighborhood bar, where everyone gets together, enjoys a few cold ones and socializes. If you&apos;re looking to unwind and unplug, Route 2 is the perfect brewery to visit. All in all, this was an amazing way to celebrate American Craft Beer Week. My girlfriend&apos;s sister told me that these breweries really made her second guess the craft beer scene in her hometown, because there are so many great choices right here along the South Shore. When I showed her that we&apos;d barely scratched the surface of what the South Shore Brewery Trail had to offer, she vowed to hit several more the next time she came back to visit. No matter what part of town you&apos;re in, there&apos;s bound to be a brewery nearby, and even if you&apos;re like me and want to try several different breweries, they&apos;re all closely located enough that you&apos;re not logging hours of drive time just to get there. So what are you waiting for? There&apos;s still time to enjoy American Craft Beer Week and there&apos;s always an amazing craft beer experience to be had right here along the South Shore.